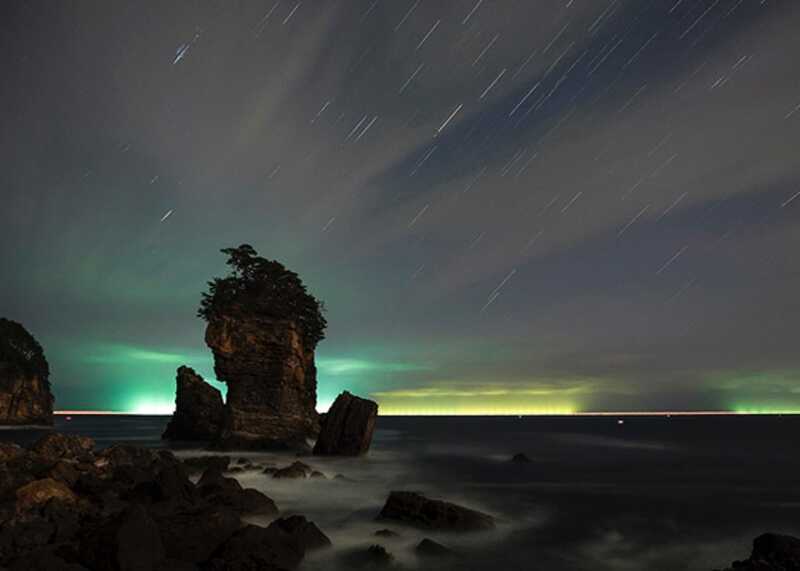 The stunning coastline from Miyako to Kuji is a must-see for all visitors to Iwate. Here we present a one-day itinerary to bring you up close with nature, to admire the surreal, powerful shapes of rock hewn over more than 100 million years, and explore the mysteries of the cliffs by small boat. The trip starts with a 20-minute bus ride from East Japan Railway Company (JR-East) Miyako Station to Jodogahama, a beach with beautiful sand. The “Jodo” in the name comes from the Buddhist concept of “pure land”, where one is released from the pain and desire of this world. The beach is said to have been named when a monk visited in the 17th century and exclaimed that it was so beautiful, “it is just like Jodo”. Another feature of this area is the sheer cliffs topped by thick forest. From the lookout is a view of white sand beach, blue sea, white volcanic rock formed 52 million years ago, and the beautiful evergreen pines. It is the gentle, refreshing scenery of a Japanese garden. If you choose a small boat tour, you will see a Blue Cave and its beautiful emerald green waters that change with the season, weather and light conditions. 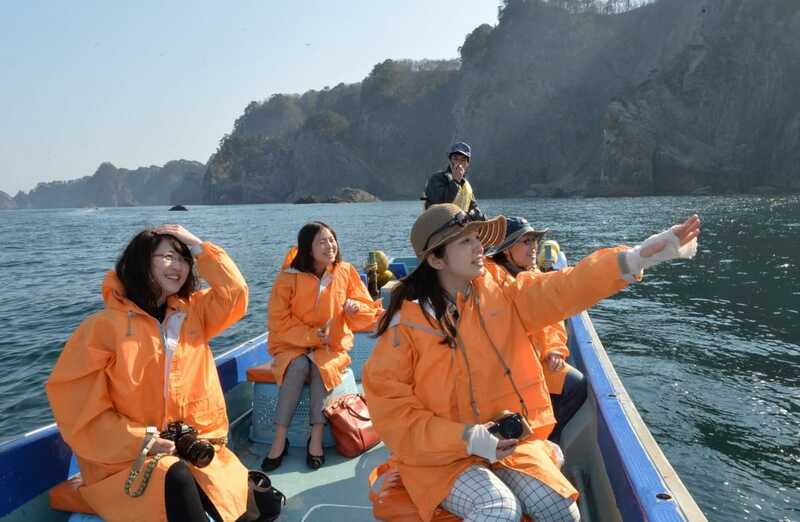 The true pleasure of a trip along the Sanriku coast is the joy of spontaneous, once-in-a-lifetime encounters with nature. Returning to JR Miyako Station, it is time to head north. 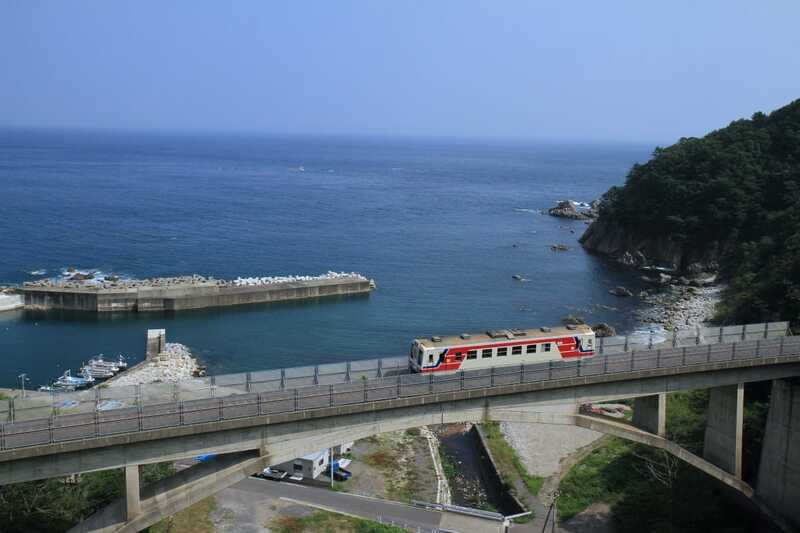 Since it opened in 1981, the Sanriku Railway has become a key means of transport for local residents. 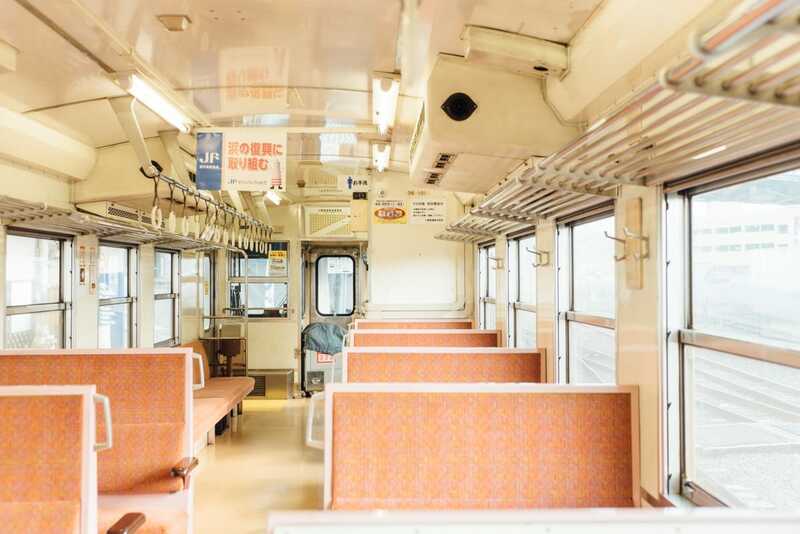 It is not just the amazing sea views out the window but the special cars equipped with pure Japanese tatami mat seats for the winter season which set the stage for a laidback, relaxing trip. In summer, do not miss out on the famous “uni (sea urchin) bento” lunchbox, sold in limited quantities only at the station. Twenty minutes or so later, you will arrive at Taro Station. Get out here and take a 30-minute walk or if you are not in the mood, a 5-minute taxi ride to the Sanno-iwa Rocks. 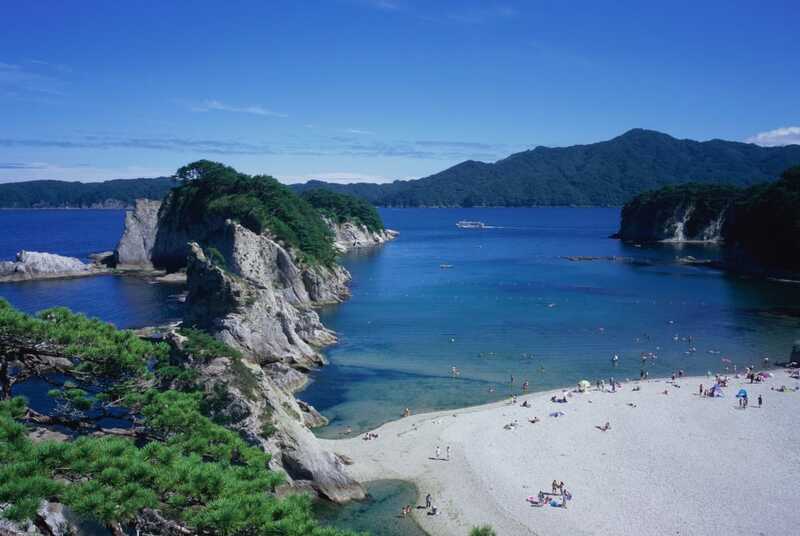 Part of the Sanriku Fukko National Park, the rocks sit quietly just off the shore. The three giant rocks consist of Otoko-iwa (Man Rock) at 50m high, flanked by Onna-iwa (Woman Rock) and Taiko-iwa (Drum Rock). The striped pattern of the rock is estimated to date from more than 100 million years ago. The dignified monument is indeed a work of art by nature, created from long millennia of wave action and winds whistling off the open sea. The holes in Otoko-iwa bear testament to wave erosion. Passing through a hole at low tide is said to bring good luck. The day of the Great East Japan Earthquake disaster saw Miyako hit by more than 15 tsunami, but the community is steadily rebuilding. The Sanno-iwa Rocks, which stood strong against the raging sea, are symbolic of the indomitable spirit of the people here. 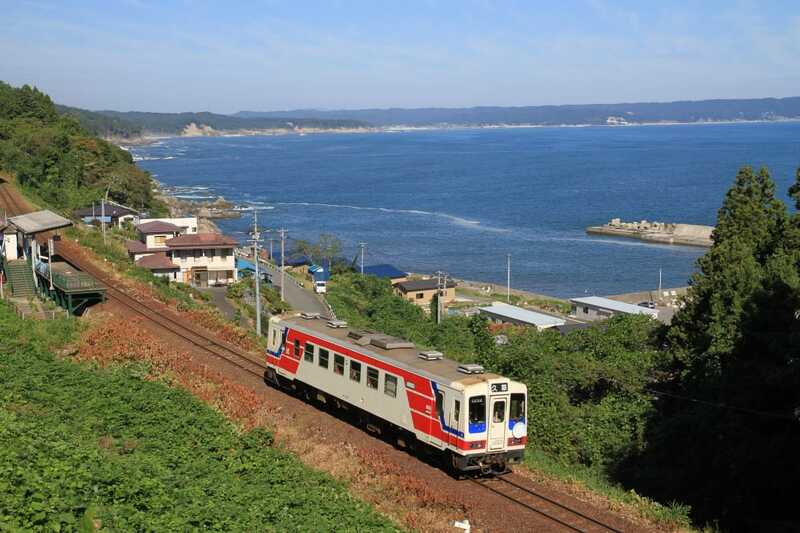 Rejoining the Sanriku Railway again from Taro Station, your next stop is Tanohata Station. This is the gateway to the Kitayamazaki Cliffs, which plunge 200m into the sea and were created by the powerful Pacific swells. This 8km-long masterpiece of nature features eccentric rock formations and a number of mysterious caves. 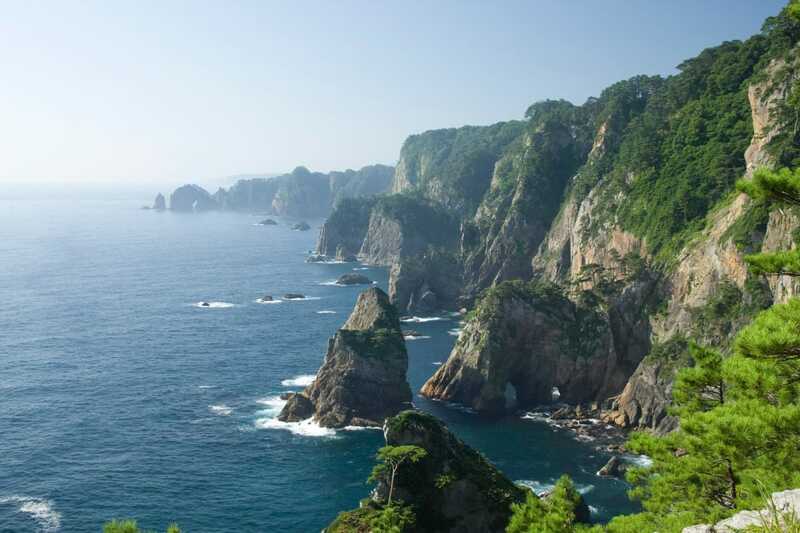 It is officially designated as Japan’s most beautiful coastline. Should you visit in late May or June, you are likely to witness the otherworldly sight of the cliffs shrouded in fog. For adventurous travelers, climbing the 736 steps from the water’s edge to the lookout is recommended, giving a true sense of the height of the cliff. A small boat tour with a local fisherman at the wheel also delivers a mighty thrill out on the water, weaving among the reefs and through sea caves. From Tanohata Station, it is a 20-minute walk to the small boat tour launching point and about 20 minutes by taxi to the lookout. Around the northern terminus of the Sanriku Railway, Kuji Station, can be found a number of lodgings from business hotels to Japanese-style inns (ryokan). 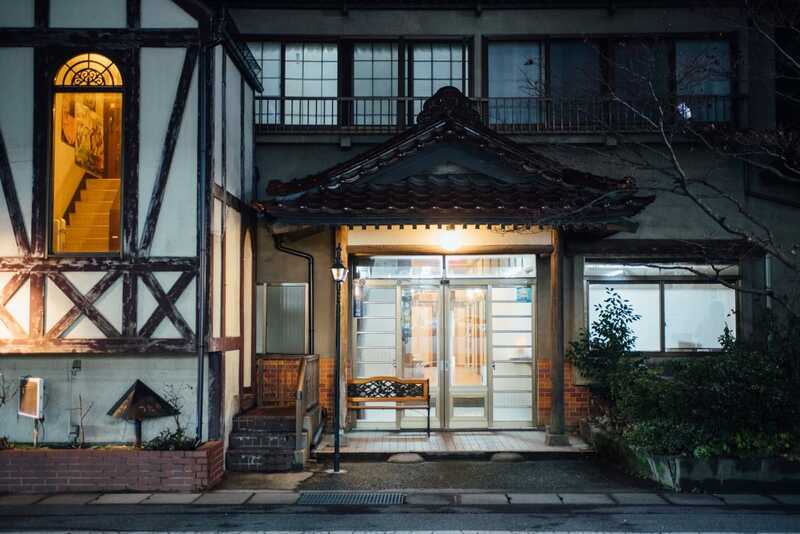 A warm welcome awaits long-distance travelers at a ryokan 3 minutes’ walk from the station. Built in 1953 by miyadaiku (temple carpenters), both the building and the hospitality are filled with the warm spirit of another era. 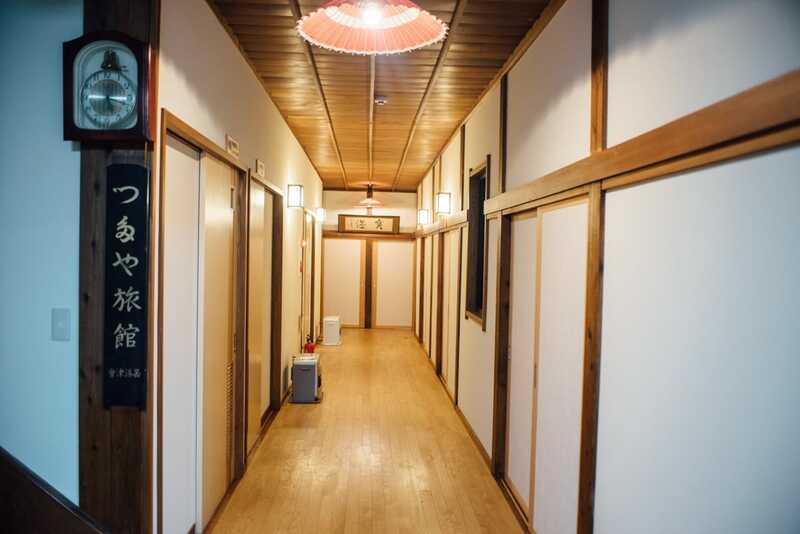 Coming through the entranceway, the customer is welcomed by a warm and gentle interior, from the lacquered sign bearing the name of the ryokan handwritten by the okami (lady manager) to the amber lamps in the hallway and the wooden floors. Guest rooms are perfectly traditional, the scent of tatami filling the air. The common space features a refrigerator, microwave oven and a bookshelf lined with manga comics – just the place for travelers to compare notes about their latest discoveries in Iwate.